30 April 2018 - Eoin O'Faodhagain from Co Donegal took a ten minute video from the Loch Ness webcam at 1207 hours. 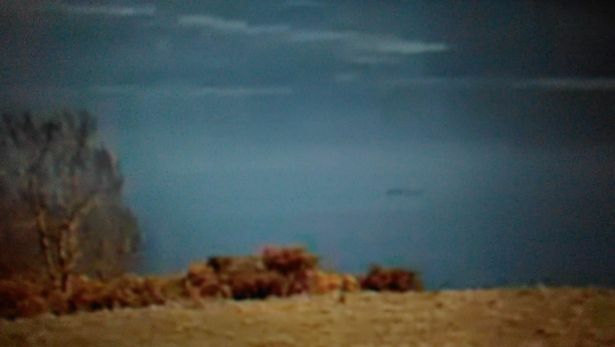 The creature moves from right to left and there were no boats visible on the water when he first noticed it but as it swam towards Urquhart bay, two cruisers came down the middle of the loch from the north and it sank briefly then came up again, but seemed to be lower in the water than when it first appeared. As the cruisers got closer to the object, it sank completely and never came back up. Of all history's greatest questions - who killed JFK? was the moon landing faked? who shot Phil Mitchell? - none is more mysterious than 'is the Loch Ness Monster real?'. Well a fan says he has an answer after filming the mythical beast frolicking about in the waters of the famous Loch for 10 minutes ... allegedly. Eoin O’Faodhagain was given a "terrific shock" after appearing to capture Nessie diving down before resurfacing. The clip has been accepted by the Official Loch Ness Monster Sightings Register, according to The Mirror. “I couldn’t believe my eyes and started recording it on my phone. It was certainly something big. It dived down and up again and dived and disappeared. It was not a boat. I would say it was Nessie.”. The news comes just days before DNA sampling on fragments of skin and scales collected from the loch in the Scottish Highlands. Mr. O'Faodhagain clearly thinks he has captured the famous monster on his mobile phone camera and he certainly has an interesting video. The clip was recorded off the computer screen which was running the live stream from the popular Nessie webcam run by Mikko Takala. The camera is mounted on a roof on a hilltop overlooking the castle (which is out of view). Based on the camera's position, the object in the clip is likely no closer than 450 meters away. Add to this the fact that the resolution of the live stream is only 360p (HD is at least 720p) then you can see why the image is fairly indistinct. A 1080p stream would be great for Nessie hunters, but that would cost more money and most of the Loch Ness money goes into the pockets of hotels, restaurants and exhibitions. But we can say some things about the video. An estimate of the size of the dark object can be made by comparing it to a known object taken from the same webcam. So below is a snap of a cruise boat coming in from the right making its way to the castle. I am not sure what boat it is, so I will assume it is one of the rented cruise boats which come in at at least 30 feet. The boat and the object match nicely for proximity and so an overlay can be done to make a size estimate as shown below. Based on this, the screen grab of the object is about 10 feet long. However, other portions of the video show the object extending and decreasing in apparent size which could be partly down to reflection, though the video is too indistinct to separate solid object from light effects. The object is also considerably slower than the boat I snapped, perhaps more than ten times slower. If this really was 10 feet of solid object, then that points to perhaps 30 feet of total object below the surface. The haziness of the object does open it up to other interpretations. Some will say it is a group of birds slowly swimming along or a log floating past or even a seal. I would say, however, that the object does appear to submerge, no longer to appear in the video as a boat approaches. That would mitigate against birds for me, which should fly off rather than disappear under the water. Logs can indeed sink, but they are more likely just to be washed ashore since they can take weeks to saturate and sink. As for the ubiquitous Loch Ness Seal, I don't think they show ten feet out of the water. In some ways, this is how I imagine the 1938 G.E.Taylor film to be, I say that never having seen it, but its apparent shape shifting is perhaps partly explained by what we see here in terms of reflections and water movement. Is this the Loch Ness Monster? It could well be, but let's exercise the other theories to see how well they stand up to scrutiny. Im not sure it is a rented cruise boat...it looks bigger to me! So that wud make the object biggger in my humble! Im glad uve made a write up on this cus ive bin waitin for it lol intrestin video in my opinion..... i always belive in two sides to the argument so id love to see mr feltham or mr raynors opinion on this video ..but all seems quiet! Maybe now uve brought it up we might get some opinions on wat it cud be...i look forward...cheers! I wondered if it was a Cruise Loch Ness boat, but wasn't sure they went that far. Of course, if it was a large cruise boat we could double/triple the numbers. I don't think there are any recordings. It's a live stream put out 24/7, that's a lot of storage. I mean there was a month between the event (April 30th) and the news hitting the media at the beginning of this month. Oh well. Wishful thinking. Another Blurry inconclusive video of "something". Yes, that's webcams for you. As I said, HD/4K would be great or move the webcam further forward. Yes GB, but had there been a recording of the “virgin' video, it could have shown something definitive. And, it has occurred to me, that if this had been a clearer shot, it could have ranked right up there with Tim Dinsdale's 1960 footage. The Loch Ness Monster Hoodoo strikes again! The Caley cruise boats range from 30ft to 40 ft.I would say if the boat in the photograph is one of these then it will be one of the bigger ones. Yes, it was suggested it was a Jacobite cruiser which must have done a turn to head to the castle. In that case, the length is up to 2.5 times greater. The footage can be viewed on youtube. I think it's a really interesting piece of footage. It certainly doesn't look like a boat, log or swimming birds that's for doggone sure! And I'd say it's too big to be a seal. Whatever it is it does sink and resurface, and does appear to be generating some white water at the front and sides from time to time. I'm impressed! Oops, the particular boat you chose is the Jacobite Warrior, rumoured to be a little over 30 feet, infact it comes in at a whopping 80 feet (and a bit) in length, what a whopper! Not sure what the exact percentage of error in your calculation must be but it's substantially nearer to 200 percent out than 100 percent out I suspect. Which as far as I can tell is a very good example of how easy it is to make wildly inaccurate calculations based on inaccurate assumptions, sceptic or not sceptic. somewhere in here we are on the same side. Thanks Steve, but in the article I did say "I am not sure what boat it is" so I played safe and assumed a smaller sized boat. I think I made that clear and I wasn't making dogmatic pronouncements on this. We've already discussed bigger sized boats in the comments above. Intriguing. Funny, I read a couple of LNIB annual reports recently and they mentioned at least a few sightings from the late 60s that were corroborated with film footage yet I've never seen any of this. Do you know anything about them Roland? I'll go back and find them next time I've got time if u don't. Oh, sorry. I didn't see the bit where anybody gave the actual length of your comparison boat....80 feet 4 inches. So if the boat is 80' that would make the object, which looks to be roughly a third the size of the boat, around 25' give or take. Certainly not a seal. Well if it is the Jacobite Warrier then the mystery object is a lot bigger than first estimated.Very interesting. Bottom line, the object was big. Yes, but as I said in the article, it is difficult to seperate the true length of anything solid from the blurred, shifting image. Incident 3 on the LNIB Annual Report from 1968 discusses a sighting that was also corroborated by a film shot by a Mr Irvine which then appeared on Tomorrow's World. I've read of other films shot within these reports too but have never seen any of the footage myself. Nor the infamous LNIB films (one grainy one of the monster on land no less). I don't care if these are bad I fail to understand why they have all disappeared. Can somebody much more resourceful and smarter than me please track down every single supposed piece of footage of the LNM ever shot and complie it into one big long video for me to watch please? I do share you desire to be able to see all relevent footage; poor quality, mistaken identity, fake, whatever. Where is Dinsdale's first film? Some of you may remember me from my past contentious feuds I had with previous persons on this blog. I really feel bad about that and it's time to come clean and I need to purge. I have been a regular visitor since 2011 and then I dropped out for awhile ( Where does the time go?) So many pass by here. up about loch ness in all aspects On that subject it would be great to hear his view and opinion on this particular video? Over to you Tony. John Alvarado i think you hit the nail on the head by saying its in the spirit of the fight. The sceptics are adamant there is nothing there so fight their corner as do the people on here who think there is something there.I think nessie is real, so does Roland and i think John aswell, Roy seems more in the middle i think, and others too. We have a nice little combination here and long may it continue. You can count me among the group of firm believers too, Gezza. I've always been fascinated by what's in the loch. The sceptics and the so called experts seem to be very quiet over this video.Do we have something thats baffled them at last?